The national president of the Association of University Staff, Bill Rosenberg, said yesterday that he had taken calls from academics around the country worried about the censorship. A "book burning" scandal has erupted at Canterbury University over an article on controversial Holocaust scholar Joel Hayward. THE decision to recall and destroy copies of the history department's journal History Now - and dump editor Ian Campbell - is dividing the academic community. Canterbury lecturer Thomas Fudge, who wrote the offending article, has resigned in disgust and plans to leave at the end of the year. Dr Fudge said he could not remain at a university that suppressed academic freedom. "It made me a hypocrite trying to teach my students to think critically and ask the tough questions - all of the academic values that universities are about - and here my department was saying, effectively, we're going to burn books." The article revisits the storm that surrounded the 1993 masters thesis of former Canterbury student Joel Hayward, which questioned the validity of Holocaust history. Dr Fudge, who lectures on medieval religious dissent and witch-hunting, explored what for Dr Hayward (right) became a career-ending controversy. He revealed in the article that Dr Hayward had been harassed and received death threats against his children. Dr Hayward suffered an emotional breakdown and left his teaching post at Massey University in June last year. He now cannot get a job. The Fate of Jews in German Hands: From Holocaust Historian to Holocaust? played on the title of his thesis, The Fate of Jews in German Hands. The article appeared on May 6. Next morning, Professor Campbell was asked to appear before his editorial committee and history department head Peter Hempenstall. Professor Campbell said he was effectively pushed: "The fact is that board disapproved of my editorial decision and, as a result, I couldn't continue as editor." An embargo was slapped on the journal and 500 copies recalled. Staff were later advised that copies of the offending journal had been destroyed on the authority of Professor Hempenstall. Another May edition of History Now was printed without the Fudge article and an editorial discussing truth and martyrdom. On May 14, Dr Fudge defended his article at a special meeting of history department academics, calling the censorship "unconscionable". Last week, he confirmed to his students that he had resigned. Professor Hempenstall declined to speak, saying the matter had now become an employment issue between the university and Dr Fudge. CANTERBURY University staff who destroyed copies of a journal containing an article on controversial Holocaust scholar Joel Hayward say they did it because of potential defamation and possible inaccuracies. The so-called "book burning" scandal has left the university in uproar and academics throughout the country concerned that the censorship of the university publication breached academic freedom. The article by Canterbury University historian Dr Thomas Fudge in the May issue of History Now examined Dr Hayward's treatment over his 1993 masters thesis, which questioned the validity of Holocaust history. Canterbury University vice-chancellor Professor Roy Sharp said yesterday that the majority of history department staff had agreed that the article, in its then form, should not be published. He cited possible inaccuracies and misleading statements that no one had been given a chance to check, the use of internal history department documents without clearance, and the naming of specific individuals and businesses which could expose the university to legal action. Professor Sharp and history department head Professor Peter Hempenstall said while a university should not prevent an academic publishing controversial or unpopular opinions, it was not obliged to publish such an article itself. There had been no attempt to stop publication elsewhere. "Indeed, Dr Fudge was offered suggestions as to other media in which he could publish." In the article, Dr Fudge asked if Dr Hayward had been the victim of a modern-day witch-hunt. He stressed academic freedom and said it was the duty of universities to challenge conventional beliefs. Dr Fudge argued that while there was nothing redemptive about the Holocaust, nor was there any redemptive value in the "pursuit of Joel Hayward along a journey from holocaust historian to the fate of personal holocaust". Dr Fudge said that in early 2001 Dr Hayward had received obscene and disturbing phonecalls with death threats directed at his children. Outraged by the censorship, Dr Fudge resigned in protest and the journal's editor, Associate Professor Ian Campbell, walked away from the editorship as a result of disapproval over his running the piece. Dr Rosenberg said the association strongly defended the right to academic freedom. It would want to ensure Dr Fudge had been treated fairly and due process was followed. Dr Rosenberg said it was possible the university's actions were in breach of statutory rights to academic freedom under the Education Act 1989. An associate law professor at Auckland University, Paul Rishworth, said it was not possible to say the decision to recall and destroy the journal was a violation of Dr Fudge's right to freedom of expression. "Academic journals are not open forums. No one has a right to have their contribution published." Professor Rishworth said this was not to say that the committee offended no legal rights, nor to say it had acted well, or wisely, either in relation to the editor or to the author of the article. The director of the New Zealand universities academic audit unit, John Jennings, agreed it was the right of any publisher to publish what it wanted. From what he had read of Dr Fudge's article it seemed well considered, but he doubted whether its censorship in an in-house journal amounted to an attack on academic freedom. Associate Professor Ian Campbell - teaches world history, Pacific history and the philosophy of history at the University of Canterbury. Was the editor of History Now. Dr Thomas Fudge - a specialist on medieval and reformation Europe with research interests in iconography and European witchcraft in the period 1100-1700 and the social implications of heresy. Professor Peter Hempenstall, head of the history department, a Pacific historian who also takes an honours course in biographical method. 1991: History postgraduate student Joel Hayward, aged in his late 20s, begins to write a master's thesis which questions the extent of the Holocaust. 1993: The 360-page thesis entitled The Fate of Jews in German Hands is completed. Described as an historiography of Holocaust revision it questioned the use of gas chambers, claimed far fewer than six million Jews died, and found no direct evidence of plans to carry out mass murder. The thesis is embargoed for three years, later extended to six years. 1994: Canterbury University awards Hayward a first-class honours pass, which was concurred by an external examiner at Waikato University. Hayward later withdraws his main conclusions but the thesis is meanwhile praised by controversial Holocaust "revisionist" historian David Irving. 1996: Hayward appointed to Massey University as a senior lecturer in defence and strategic studies. 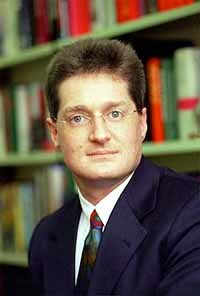 1999: Hayward asks Canterbury University to withdraw his thesis from its library, but is refused. He is allowed to write an addendum. Early 2000: Waikato University Professor Dov Bing reviews the thesis for the NZ Jewish Chronicle and Hayward faces a strong public backlash. April 2000: New Zealand Jewish Council condemns Canterbury University for condoning the publication of the thesis and refusal to withdraw it from its library. December 2000: An independent inquiry headed by retired judge Sir Ian Barker finds Hayward's thesis was faulty and its conclusion unjustified. The university vice-chancellor, Daryl Le Grew, apologises to the Jewish community. June 2002: Hayward resigns from Massey University to recover from a nervous breakdown caused by the stress from the publicity and death threats to him and his family. Has since worked as a freelance historical writer, having published books including his most recent - a thematic study on Vice-Admiral Horatio Nelson called For God and Glory. This story also featured as a major article in The Christchurch Press Nedw Zealand on Tuesday July 22, 2003 on pages A1 (i.e. the front page), A3 and A9.